The summer of 2017 was hot with sweltering temperatures and hurricanes; Harvey, Irma, Maria, and Ophelia with their devastating consequences also effected European coasts, draw attention to the topic of global warming: the main cause of these extreme and violent meteorological events. Scientists agree that the phenomenon is primarily caused by the greenhouse effect, linked to fossil-fueled energy consumption. If today’s average terrestrial temperature has grown by +0.7 ° C compared to the pre-industrial era, experts say that to avoid a further increase, it is necessary to contain total greenhouse gas emissions. Starting from the United Nations Climate Change Convention (UNI-CCC), Member States have progressively started to set new, increasingly challenging targets, including in the HVAC & R sector. Reducing the greenhouse effect by reducing CO2 emissions and promoting a sustainable development model by encouraging the adoption of renewable energy sources and raising energy efficiency targets have been the first steps towards this important change. Thanks to their ability to disintegrate very quickly into the atmosphere, HFO fluorinated molecules have a very low environmental impact, while retaining thermodynamic properties very similar to HFCs, and thus continuing to guarantee high energy performance levels. In particular, the refrigerant HFO 1234ze selected by Mitsubishi Electric Hydronics & IT Cooling Systems for chillers ensures GWP levels equal to 7 (compared to GWP values ​​of 1430 for R134a gas) and no toxicity. For these reasons, HFO 1234ze has been approved by international standards, such as ASHRAE 34, ISO 817, and is in line with international legislation on greenhouse gases. Therefore, is not a surprise if environmentally-friendly customers or countries have chosen Climaveneta and RC units with the new eco-compatible refrigerants for their projects, there are 83 HFO units installed in Europe in the last two years, for over 52 MW total capacity. With the aim of maximizing the energy efficiency of the building, 27% of these units were selected in the free-cooling version and 73% with water source. 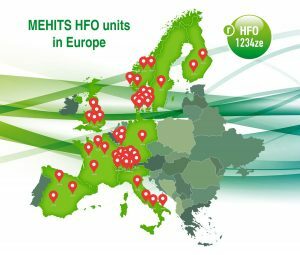 Italy, Spain, France, Germany, United Kingdom, Switzerland, Luxembourg, Denmark, Norway, Sweden, and Finland are the “greenest” countries in Europe, those with the largest number of HFO units installed. We have interesting projects for all segments covered by Mitsubishi Electric Hydronics & IT Cooling Systems, from IT Cooling to Process, and Comfort applications which represent the biggest slice of the cake. One of the most important and innovative HFO units installation is Fortum’s district heating in Espoo, Finland where Mitsubishi Electric Hydronics & IT Cooling Systems, through its brand Climaveneta has recently supplied two FOCS2-W HFO/H/CA/S 5422 heat pumps. Fortum, a Finnish energy company, will utilize waste heat from a data center and supply the heat into a district heating network. The data center belongs to Ericsson, a multinational networking and telecommunications equipment and services company based in Sweden. Using the heat waste of a data center is a good example of how it is actively possible to move towards low-carbon district heating. 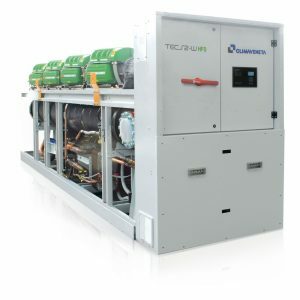 In this project Climaveneta FOCS2-W HFO/H/CA/S 5422 heat pumps have been selected for their efficiency and sustainability as they use HFO-1234ze refrigerant (1,3,3,3-Tetrafluoropropene). Another challenging project with HFO units installed is Victorinox Swiss Army Watch in Delémont. Victorinox is a knife manufacturer based in Switzerland since 1884. Victorinox represents quality, functionality, innovation, and iconic design for more than 130 years. Today, Victorinox is an international company that offers six categories of products: Swiss knives, kitchen and professional knives, watches, luggage, and perfumes. Delémont is one of the two existing production plants in Switzerland for Victorinox knives, as well as a qualified factory for Victorinox and Wenger watches. In 2013, the Company invested to keep high performing cooling conditions in the building, by creating an efficient HVAC system for this production plant. The system was based on 1 Climaveneta ERACS2Q SL CA 1962 multi-purpose heat pump with heat recovery and performed well, granting the smartest use of energy and the most reliable cooling conditions to the building. Following this successful installation, in 2017 another Climaveneta unit, 1 FX HFO SL-E S 1702 was installed to grant the most efficient and sustainable process cooling to the whole plant. In line with Swiss environmental regulations, FX was delivered with the new green HFO 1234ze refrigerant: a solution that complies with the highest efficiency targets required by modern projects, whilst offering an eco-friendly alternative to HFCs.